Welcome to the Oropendola Blog! Hello World, Before starting off this journal, we thought we'd take the chance to quickly introduce ourselves and the Oropendola Blog. Who are we and what is all this about? Excellent question, let us try to articulate a good enough answer. We are Greta and Nick, two science graduates, wildlife enthusiasts, conservationists, camera maniacs, sound recordists and insect lovers who make films about animals. So, I guess we can call ourselves wildlife filmmakers, or at least that's what we are aspiring to be. Recently we have dedicated a considerable amount of our time (and sweat) to filming insects and recording their fascinating sounds in the wild. We spent nearly two months doing this, in two locations within the Amazon, and it would be an understatement to say it was an incredible experience. Now we're back at base, in the north-west of England, with the intention to keep exploring the sounds and the wildlife of this wintery land and edit the footage acquired in South America. So this, the Oropendola Blog, will be our journal, where we'll share our passion for wildlife sound recording and filming, and a few stories about our past, present and future adventures. The distinctive and captivating call of the Oropendola was one of the first sounds we heard as we entered the rainforest, and one of the last to accompany us as we left. It was also one of the most common bird calls in general and we could hear it pretty much everyday, from dawn to sunset. 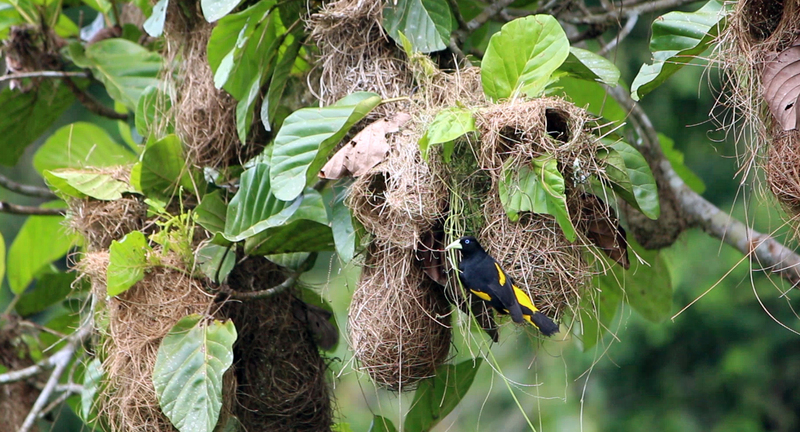 As if singing wasn't enough to attract our attention, a striking yellow tail and beak made it one of the easiest birds to spot in the canopy, as was the utterly bizarre nest it builds, shaped like a teardrop or a pendulum (hence the name) hanging from the trees. After so many weeks in the company of this magnificent bird, we often find ourselves missing its songs. But luckily for us, we have many hours of sound recordings from the rainforest, and the Oropendola features in most of them. Here's a short snippet of one... can you hear its calls?